feeling deep pleasure or satisfaction as a result of one's own achievements, qualities, or possessions or those of someone with whom one is closely associated. This week I am feeling proud. Proud for being given a promotion at work. I am now a Finance Manager. We'll gloss over the fact that in the Finance Department there is the huge sum of one staff member...I'll be the Manager of...ME! We'll even gloss over the fact that my role and responsibilities remain largely the same and the small pay rise that I've been given covers the rise that I didn't get along with everyone else last September. Because it isn't those things that have made me proud. I'm proudest for the fact that the MD of the company (who is leaving) told every member of staff in a meeting, that he has confidence in my ability to complete my work without it needing to be double checked, that the decisions that I make will be the best for the company, that I have earned my right to be a member of the Management Team and that I am an asset to the company. I lost confidence in my ability in my last job. I lost my way and I lost the power to make the right decisions. Being told, and more importantly, believing that I have become a better employee over the last two years has given me the proudest of feelings. That and being chosen to review a pretty expensive bit of kit on this little blog of mine...I'm not going to think about the video review element of it just yet - that's for after our holiday! 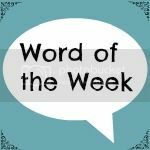 As always I'm joining in the week with the fabulous Jocelyn over at The Reading Residence to read more great Word of the Week posts - go on...pop over and take a look at a few others! Congratulations! That is absolutely fantastic!! Well done! !